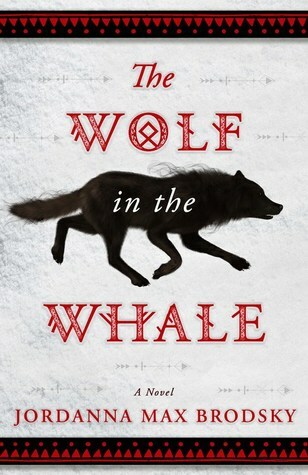 I expected to enjoy The Wolf and the Whale, but what I was not prepared for was how completely it swept me off my feet. In this stunning masterpiece, Jordanna Max Brodsky weaves a cinematic tale of adventure and survival, blending history, mythology and timeless romance. All of this is set to the epic backdrop of the Arctic wilderness at a time of great change towards the end of the first millennium. Our story follows Omat, a young Inuit girl born into her tribe during a time of tragedy. But in death, her father gave his daughter his strong hunter’s soul, and the spirits sent the Wolf to watch over the child so that she would survive. Omat’s grandfather, a wise shaman, recognized the gift in her and believed that she was meant to follow in his footsteps, so he raises her as a boy to hunt and protect her people, while also teaching her the ways to commune with the spirits. However, as Omat grew, some in her group began to question her role, concerned that the spirits are angered by the taboo of a woman hunting. Their people are starving, and with no new children being born, they are slowly dying out. So, when their group happened to come across another Inuit band on the ice one day, Omat and her grandfather thought for certain that their prayers have been answered. Sadly, they could not have been more wrong. As Omat finds her entire sense of identity unraveling, her life is also now in danger because of the newcomers. But an even greater threat looms on the horizon, in the form of a group of Norse explorers bringing only violence and death. As the gods and spirits of multiple pantheons look on, Omat must find common ground with an unlikely ally and embark on a perilous journey together that will determine the fate of both their peoples. The Wolf in the Whale is a coming-of-age story unlike any other. It is also about a meeting of two cultures. Told in gorgeously lush prose, this tale unfolds over a number of years, though most of it follows Omat’s life through her young adulthood. Painstakingly researched, as evidenced by the author’s extensive notes on the historical period, the setting was brought to life with incredible attention to detail. Like her first trilogy, Olympus Bound, Brodsky’s new novel perfectly balances myth and reality in an exquisite cocktail of facts and fantastical elements, creating a world infused with magic and folklore. Here you can read about the Norse gods, as well as Inuit traditions of animism and shamanism. There is also much I would like to say about Omat. This is the story of her struggle to overcome many hardships, some horrific, but she manages to emerge a stronger and more determined person each time. Though her lessons in loss have been huge, they have also shaped her in ways that were fascinating to watch. Readers get to witness her transformation from an overconfident and short-sighted youth to a more levelheaded adult who has come to realize that no fate is set in stone—and one should never take anything, or anyone, for granted. Omat’s journey was also an exploration into gender roles that I found unexpectedly well-balanced and insightful. Our protagonist begins this tale as a proud, almost arrogant shaman-in-training who revels in her special place in the group, disdaining women’s work and the female body because she believes them to be weak. Raised as a boy in a girl’s body, all Omat wanted was to become a man—until the spirits turned on her and took away her magic, leaving her untethered and her future in doubt. Over the course of this novel, Omat gradually reconciles herself to her new path, learning to appreciate the strength and skills of a woman, ultimately embracing both the masculine and the feminine, because as in all things, life requires balance. Speaking of which, one of the most significant events in this book is Omat’s meeting with Brandr, a Viking warrior with whom she develops a complex relationship that teaches her more about that balance, as well as how to trust and love. I’m a sucker for stories about disparate strangers from worlds apart who come together and form a deep bond, so it was no wonder that I found myself completely enthralled by these two. Plus, what a delightfully interesting little family they made along with Omat’s three companion wolves; I simply could not get enough of their interactions together. In short, I think I have my first real contender for my list of best books of 2019. No surprise that it came from the imaginative mind of Jordanna Max Brodsky, who has impressed me before with her stunning prose and expert storytelling. With the courageous Omat at the story’s heart and a beautifully rendered world filled with magic, myth and history, The Wolf in the Whale is a novel that will enchant and captivate fantasy and historical fiction fans alike. Ooh I’m glad to hear this was good. I’ve been very curious after really liking The Immortals and liking the second book a bit less- and I haven’t finished that series yet, but this one catches my eye with the Inuit and Norse cultures coming together. I love the sound of it, and this is the first review I’ve seen, so yay! Yes yes yes, read it! I was the same way with the Immortals series, still haven’t finished the trilogy either. But this was just divine (no pun intended). Great post! The story looks amazing, I don’t know a lot of books on inuits! I can’t think of many books either! Yeah, I loved your review! Glad this one worked so well for you too! I keep hearing such great things about this one! It seems like it’s come out of the blue as well. So glad you loved it. 5/5 is a huge endorsement from you. I have it on my list but am thinking I will have to squeeze it in sooner rather than later. Thanks for the fantastic review! I’m glad this book is getting more buzz! It only landed on my radar because I was familiar with the author’s Greek gods series. This one was pubbed under another imprint, but when I saw her name, I knew I had to check it out! I’ve been wanting to read this one and your review sealed the deal. I’m going to request it from my library and see if they’ll get it. A 5/5 rating is pretty impressive and your review has me wanting to dive in sooner rather than later. Yay! I hope you get to read it soon and that you will love it as much as I did! Glad to hear this one got all the stars. It has been on me list since I first glimpsed it. I now need to get me hands on a copy. Lovely review matey! Thank you, I hope you get to check it out! It was lovely! Best book I’ve read in ages! I’m so excited to hear that! I know you’ll love this one! wow it looks really well done and I confess that I didn’t know about it so you me me definitely curious! I think this might work well for you, Melliane! I have to say her first series kind of fell off for me after book two. I still haven’t read book 3. But this one was amazing, I’m glad I read it! Thanks, good sell, I’m going to look into this. Seems like an interesting setting. Oh wow, this one looks really good! It was wonderful, my first 5 star book of the year too, lol! It seems this one is filled with many things to think about! Excellent review Mogsy! I’m so so glad you loved this too! I was completely blown away by this book as well!! I totally agree that this is an amazing coming of age series and a masterpiece 😀 I definitely think this is a contender for one of my best books of the year too! 😀 Brilliant review! YES! Blown away. Totally. I have a feeling it will be on many “best of” lists, I can’t wait for more people to check it out! Oh my goodness!!! I need this. I was already wishing for it, but now it’s a must! So glad to hear it, I hope you get to read it soon, and I can’t wait to hear what you think! Sounds like you really loved this book if you have it on a possible book of the year list! I love when a book really delivers for me! Oooh! My book club would LOVE this! I’ll have to pitch it! Thanks for putting this on my radar!